From Nov. 1, 2005 to Oct. 30, 2006, Sheraton Grande Walkerhill will be featuring an industry leading, "Holiday of Kings Program" especially for VIP's, offering a differentiated assembly of premium services, drawing on the VIP know-how and expertise that made Sheraton Grande Walkerhill famous. This Holiday of Kings Program presents the opportunity for guests to experience a once in a lifetime taste of the world's best accommodations and service, normally reserved for celebrities and heads of state. Sheraton Grande Walkerhill's Holiday of Kings Program consists of your choice of "The Unforgettable Evening" or "A Diamond Affair," allowing you to sample the life of luxury. The Unforgettable Evening program guests start off their evening with a Private Dinner Party with friends and family at Aston House, Walkerhill's spectacular cliff-top, VIP mansion, decorated with candles. As a program host, you may invite up to 10 people to a black-tie dinner party in your private villa, overlooking the Han River. The dinner menu for your party will be custom designed to your own unique tastes in consultation with a private chef. To instill the proper air of luxury, the program host will be afforded complimentary use of jewelry and an evening dress from a collection of world famous designers, to greet their dinner guests for the evening (limited to the hostess only). After dinner, you will spend an evening of absolute luxury in the finest accommodations, the Aston Paragon Suite, complete with a Special Bar set up, followed by a private breakfast served in your villa. 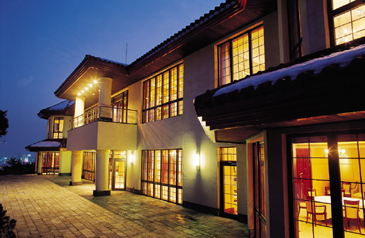 In addition, guests can relax with a special treatment at the Away Spa at W Seoul-Walkerhill. A Diamond Affair program guests will spend one night in Walkerhill's most luxurious suite, the Diamond Suite, along with a Special Bar arrangement and full butler service throughout your stay. Guests may select any restaurant at Sheraton Grande Walkerhill for their dinner, followed by prime seating at the KTR Wine Show, with our compliments. Breakfast in bed follows the next morning along with an Away Spa Treatment at W Seoul-Walkerhill, again at no extra charge. The price for "The Unforgettable Evening" is ￦15,000,000 (Tax and Service charge excluded) and the price for "A Diamond Affair" is ￦5,000,000 (Tax and Service charge excluded). These two programs each offer unforgettable memories to their guests, through the finest in luxury accommodations, quality service and unique offerings.